Faultless locations and dreamy spas aside, if there’s one thing Anantara hotels is good at, it’s the ability to produce such tempting dining options, that heading out to sample the destination’s local cuisine could completely slip your mind. Occupying the city’s original British Consulate, an old colonial house that sits at the heart of the sleek Kerry Hill-designed Anantara Chiang Mai - itself set on the banks of the tranquil Mae Ping River - The Service 1921 is named for the year the building opened and takes its inspiration from the British government’s secret intelligence service with a heavy masculine aesthetic of sold wood flooring and wall panels; antique rugs; vintage lamps and fans; and an array of fictitious tchotchke’s from old security intelligence files to braille and morse code signage that rounds off the concept nicely. 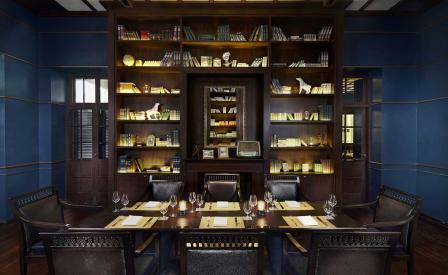 The mystery of the space is reinforced by a secret bookshelf door that swings open to reveal the private dining room. The best seats in the house are on the upper wraparound veranda, where the gentle breeze from the river will temper some of the spicier dishes on the Thai, Chinese Szechuan and Vietnamese menu, such as the yum ped yang, a duck salad with a chilli lime dressing, or the tom sab nua, a northern Thai soup made with braised beef knuckle, basil, chilli and galangal. If that doesn’t do the trick, the British Consulate - a vodka cocktail with tangerine-infused crushed ice - will.